With a little more than a third of the Major League Baseball season now in the books, it is still hard to get a handle on the current edition of the Cleveland Indians. Are they the team that was swept at home by Oakland, being outscored 30-6 in the three games? Or the one that followed that series by winning five-of-six, including a three-game sweep of Detroit? 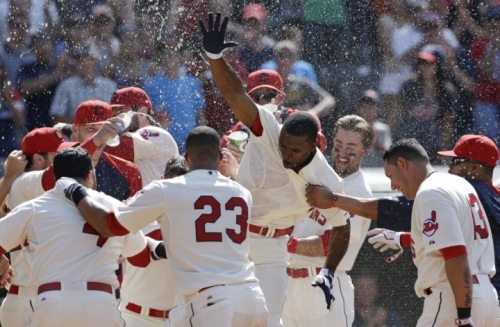 Did we see the true Tribe during last week’s sweep at the hands of the Chicago White Sox? Or was it this past weekend when they swept the Colorado Rockies? Maybe the truth lies somewhere in the middle, which would explain the Tribe’s current record of 27-30, which leaves the Indians a (somewhat) manageable six games out of first place in the A.L. Central Division and three games out of the Wild Card (although their are six teams ahead of them). As the Indians host Boston before heading out on a 1o-game road trip – just in time for school to let out and the weather to warm up – that will take them to Texas, Kansas City and Boston, let’s look at what’s gone right and what’s gone wrong so far this season. Thumbs up: Lonnie Chisenhall is hitting .373 in May after batting .362 in April and leads the Tribe in batting with a .361 average (although he has about 80 less at bats that Michael Brantley). More impressively, Chisenhall is batting .529 vs. left-handed pitchers. While the sample size may be small, Chisenhall has only 17 at-bats against lefties, that number is still impressive, especially when you consider that he batted just .194 over the past three seasons against lefties. “It’s nice, because I feel like I’ve earned it. 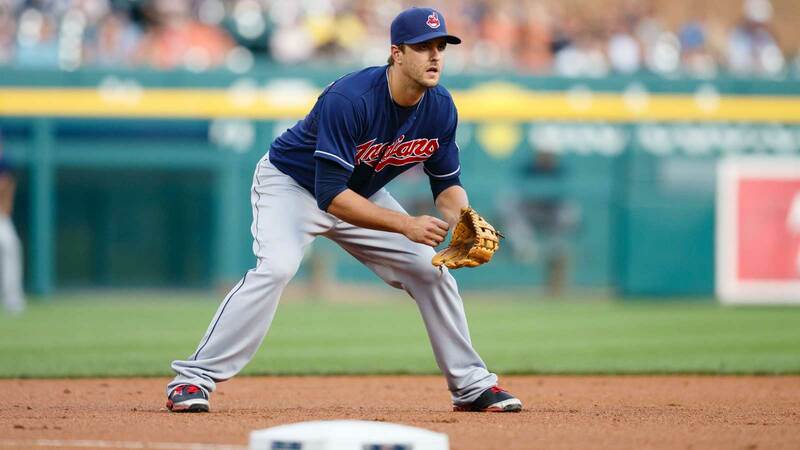 That was the big goal,” Chisenhall told the team’s website. “Last year it was a little different. They told me I was the third baseman out of spring. This year, it feels different. Nothing was given to me this year. I was coming in without a title. Thumbs down: If the Tribe had any viable options at shortstop, they probably would have moved Asdrubal Cabrera in the off-season. As it is, this is most likely his last year in town as Cabrera heads for free agency this fall. It hasn’t been much of a contract push so far though, as Cabrera has already made eight errors (compared to nine all of last season), and is batting just .242 on the season, continuing a trend where his average has gone down each season since 2009. Cabrera did hit .274 in May, a number that was pulled down by batting just .130 over the past week, but there’s little reason to think the Tribe is going to much more out of him this season. Theoretically the Tribe could move Cabrera for whatever they can get for him and promote Franciso Lindor to take over at shortstop – he’s most likely coming up in 2015 anyway – but it makes sense for the Indians to stay patient. By keeping Lindor in the minors until at least the middle of June, the Tribe can hold off on Lindor earning service time and make sure he will not become arbitration eligible until after the 2017 season at the earliest. So for now, we just have to hope that Cabrera can at least work himself back to being at least an average player. Thumbs up: Somehow, while we weren’t looking, Michael Brantley has gone from being a nice player to a very good player, quite possibly the best on the team. Defensively he has always been solid, but this year he’s upped his offensive game, leading the Tribe in batting average, home runs, RBI, on-base percentage and hits. Brantley has been particularly effective at home, batting .348 and hitting safely in 19 consecutive games at Progressive Field. 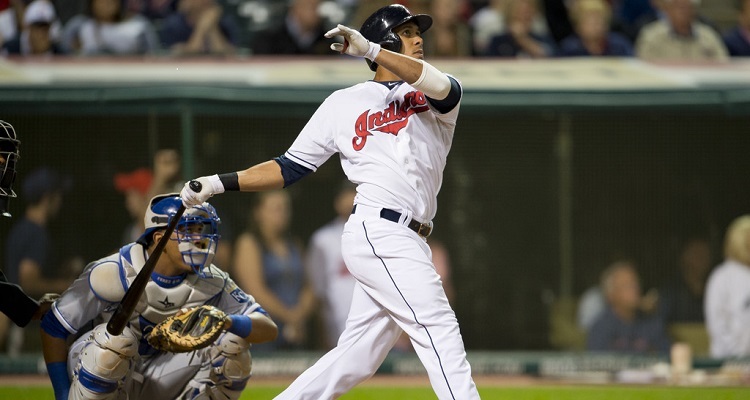 The hitting streak was the longest by a Tribe player since Julio Franco also hit in 19 consecutive games in 1984. The only players in franchise history to top Brantley are Miguel Dilone (27 games in 1980) and Hal Troskey (30 games in 1936). While it may be taking the rest of baseball to catch on to Brantley, Francona isn’t one of them. 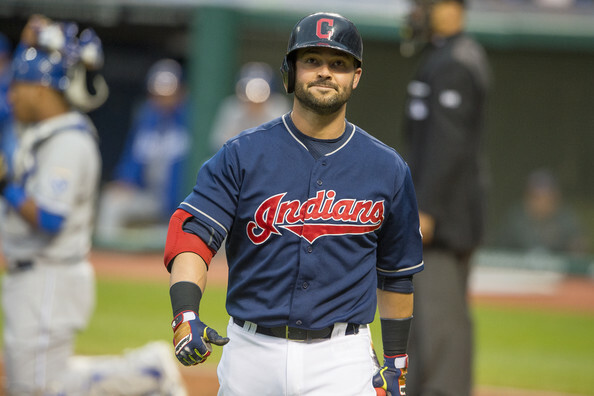 Thumbs down: We were definitely not on board when the Indians handed Nick Swisher the largest free-agent contract in franchise history, and so far he hasn’t done anything to change our mind. Among American League first basemen, Swisher is 15th in batting average and RBI, 14th in home runs, 16th in OPS, 13th in on-base percentage, and has the sixth-most strikeouts. After hitting just .246 last season and driving in a career-low 63 runs, Swisher hit a combined .210 in April and May before landing on the 15-day disabled list with a knee injury. Swisher is currently rehabbing in a pool and may be able to resume “land-based activities” soon. A 33-year-old with arthritic knees who is under contract for three more years after this season. Fun! Thumbs up: Much like how Brantley has turned into the team’s best hitter, Corey Kluber has somehow worked himself into being the Tribe’s best starting pitcher. Kluber just closed out a month where he was 4-0 with 2.09 ERA in six starts, and 60 strikeouts – making him just the second pitcher in the past 10 years to strike out 60 or more batters in a single month. (h/t @MLBastian). He currently leads the majors with 95 strikeouts. Thumbs down: The Indians signed John Axford in the off-season to be the team’s closer and that plan lasted until May 9. Things started out OK, as Axford had eight saves and a 2.53 ERA through the end of April. But once the calendar flipped to May, things fell apart. First there was the game-winning three-run homer he gave up to the White Sox on May 4, followed by him being removed during the ninth inning of a game against Tampa. 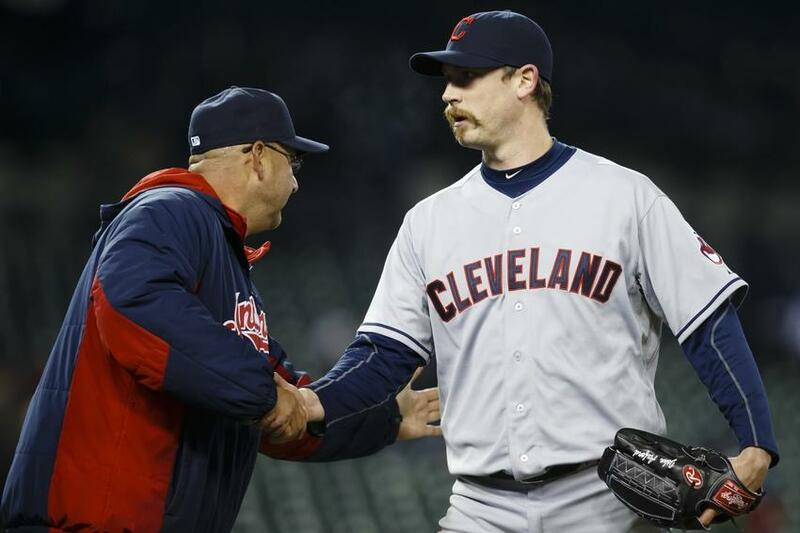 As the walks (10) and hits (11) mounted throughout the month, Francona took Axford out of the closer’s role on May 10. Since losing the closer’s job, Axford has pitched a bit better, allowing just one earned run in seven innings, but whether or not that’s enough for Francona to trust him again remains to be seen. Thumbs down: The Indians have been struggling with injuries to some of their key players, including second baseman Jason Kipnis, who still hasn’t found his hitting stroke after missing almost all of the month of May with an oblique injury, Carlos Santana, who has been in a season-long slump and is still on the concussion disabled list, and Zach McCallister, who after a decent start to the season had a horrific three-game stretch where he posted an ERA of 19.96 before landing in the disabled list with a back issue. It’s a credit to their depth and to Francona’s handling of the roster that the Indians have not suffered more from the injuries. Thumbs up: Heading into Monday night’s game against Boston, the Tribe had the best home record in the American League at 18-11, and the 18 wins were the second-most in all of baseball, trailing only Miami. Of course, the home record is balanced out by Thumbs down the road record. The Indians are just 9-19 away from Progressive Field, with the nine road wins being the second-fewest in all of baseball, trailing, interestingly enough, the Marlins. With the aforementioned 10-game road trip coming up, the Tribe better figure out their road issues in a hurry. We actually feel a little bit better at the end of this post than we did at the beginning. Sure, the Indians have problems, but the majority of them don’t seem to much to overcome. They need to have the starting pitching settle down – McCallister returning to health and Justin Masterson finding some consistency would be a good start – and get a few more players starting to hit like they can. While it looked like the Tigers were getting ready to run away with the division a few weeks ago, but the three-game sweep at the hands of the Tribe sent Detroit on a current streak where they have lost 1o-of-14. So the Indians are not so far back that, with a decent stretch of play, they can’t put some pressure on the Tigers. The next couple of weeks will definitely reveal whether or not the Tribe has it in them.